Some people would say that Caspar Babypants get extra attention, because of Chris Ballew. Who? The lead singer of the band “The Presidents of the USA” (yeah that bald guy). Let’s see…. First Caspar Babypants album “THIS IS FUN!” only sold a couple of hundred copies on it’s first months. That’s how much attention you get when you are the lead singer of a twice Grammy-nominated band, and have sold over 4 million records. The word got out when Chris took the Caspar Babypants show on the road. More and more people showed up, and then came the second album “MORE PLEASE!” (2009), and when the third album “THIS IS FUN!” (2010) came out, Caspar Babypants was EVERYWHERE – with a marketing budget of $0.00! 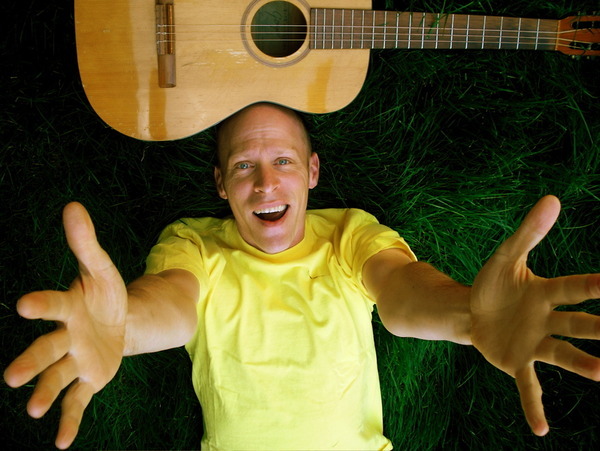 Thanks to Chris Ballew’s skills to improvise during live shows, Caspar Babypants’ shows are always fresh and funny, which is one of the reasons why Caspar Babypants’ shows are sold out nearly every time. By the amount of fan videos that are out there, you can tell that parents are into Caspar Babypants too. See Caspar Babypants’ Youtube-channel. This pretty much explains the whole Caspar Babypants phenomenon, and the philosophy behind the music of Caspar Babypants. Keeping families relaxed, relieving stress and tension, bringing families together…and of course bringing peace to those long car rides. “Sing Along!” A new release by Caspar Babypants is out due August 16, 2011. Tags:Caspar Babypants, Chris Ballew, Presidents Of The USA, Sing Along!